Perhaps the most famous battle of the Civil War took place at Gettysburg, PA, July 1 to July 3, 1863. At the end of the battle, the Union's Army of the Potomac had successfully repelled the second invasion of the North by the Confederacy's Army of Northern Virginia. Several months later, President Lincoln went to Gettysburg to speak at the dedication of the cemetery for the Union war dead. Speaking of a "new birth of freedom," he delivered one of the most memorable speeches in U.S. history. Now we are engaged in a great civil war, testing whether that nation, or any nation so conceived, and so dedicated, can long endure. We are met on a great battle field of that war. We have come to dedicate a portion of it, as a final resting place for those who died here, that the nation might live. This we may, in all propriety do. But, in a larger sense, we can not dedicate -- we can not consecrate -- we can not hallow, this ground-- The brave men, living and dead, who struggled here, have hallowed it, far above our poor power to add or detract. The world will little note, nor long remember what we say here; while it can never forget what they did here. It is rather for us, the living, to stand here, we here be dedica-ted to the great task remaining before us -- that, from these honored dead we take increased devotion to that cause for which they here, gave the last full measure of devotion -- that we here highly resolve these dead shall not have died in vain; that the nation, shall have a new birth of freedom, and that government of the people by the people for the people, shall not perish from the earth. 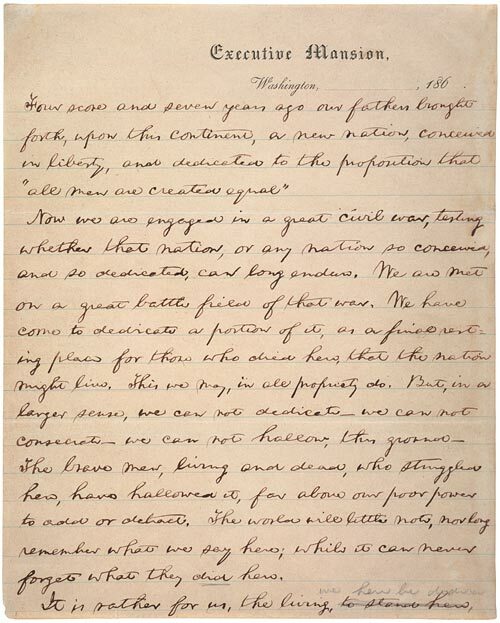 Abraham Lincoln, Draft of the Gettysburg Address: Nicolay Copy. Transcribed and annotated by the Lincoln Studies Center, Knox College, Galesburg, Illinois. 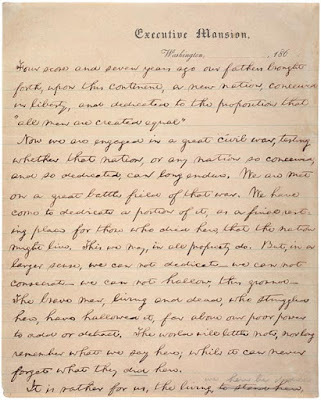 Available at Abraham Lincoln Papers at the Library of Congress, Manuscript Division (Washington, D.C.: American Memory Project, [2000-02]), http://memory.loc.gov/ammem/alhtml/malhome.html.